Labeling a classroom helps expose children to a print-rich environment as well as provides organization so students know where everything belongs. You can label specific areas, objects, and containers. LessonPix.com provides "Picture Cards" which are square cards that contain a bigger picture and smaller word and "Picture and Word Cards" that conatin a bigger Word and smaller picture. You can choose the size and style to best label your classroom. Center Signs - Clearly define and label various learning centers in the classroom. 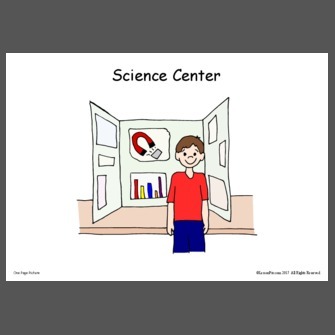 For example, you may have a sign that says "Writing Center" or "Science Center". Make sure the students understand how many children can be in the learning center at a time, how to work in the center, and how to put materials away. Take a Tour - In the beginning of the school year, take a tour of the classroom and point out the labels. Explain how everything has a place. By keeping the classroom organized, all students know where things belong if they need it. It is a great way to share and work together. 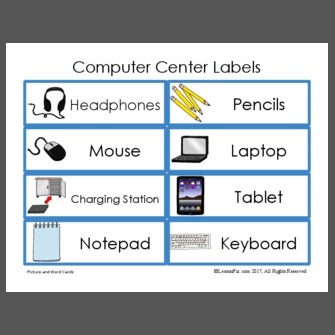 Label Items around the Classroom - Place labels on various items around the classroom such as the TV, doors, windows, desk, pencil sharpener, computers, etc. The pictures can teach lower level students the connection between objects to pictures to words. With this daily exposure, children can learn to read and spell common items in the classroom. Label Items with core words - Rather than just labeling items around the room, label with core vocabulary words. Examples: "window" to "look out window"; "door" to "open door" or "out door"; and "lights" to "turn on lights" and "turn off lights". Classroom Manipulatives - I print 2 copies of the manipulatives in my classroom such as pattern blocks, unifix cubes, legos, and lacing cards. I place one label on the bucket that holds the manipulative and one on the shelf. Scavenger Hunt - To teach the organization of the classroom, you may start the year with a scavenger hunt. When labeling the classroom, make an extra set of labels. Sort the Picture Cards into equal numbered piles. During the first week of school, divide the class into groups and give each group a pile of lables. See if the group can work together to find the matching pictures cards in the classroom. Here are labels for a computer center station color-coded in blue. 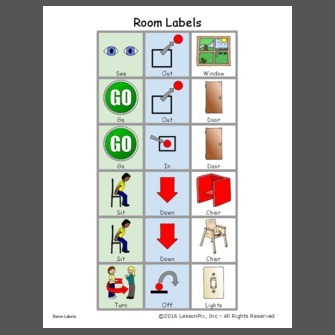 Here are labels for my classroom using core vocabulary. I cut each row to make a sentence strip with core words and fringe (go out door). These are placed on items around the classroom. The "eat snack" is on the snack cabinet. The "Where play centers" is on our center name chart where children take their name and choose a learning center. You will notice "like eat apples" which is placed on a class chart displayed in the room where the students graphed: "My favorite apple"- red, yellow, or green. There is also a strip that says "not take teacher's stuff". This is for my desk in which they are not allowed to touch.